Did I spend a pretty penny on a pretty standard lip color just for the glittery tube? Perhaps. 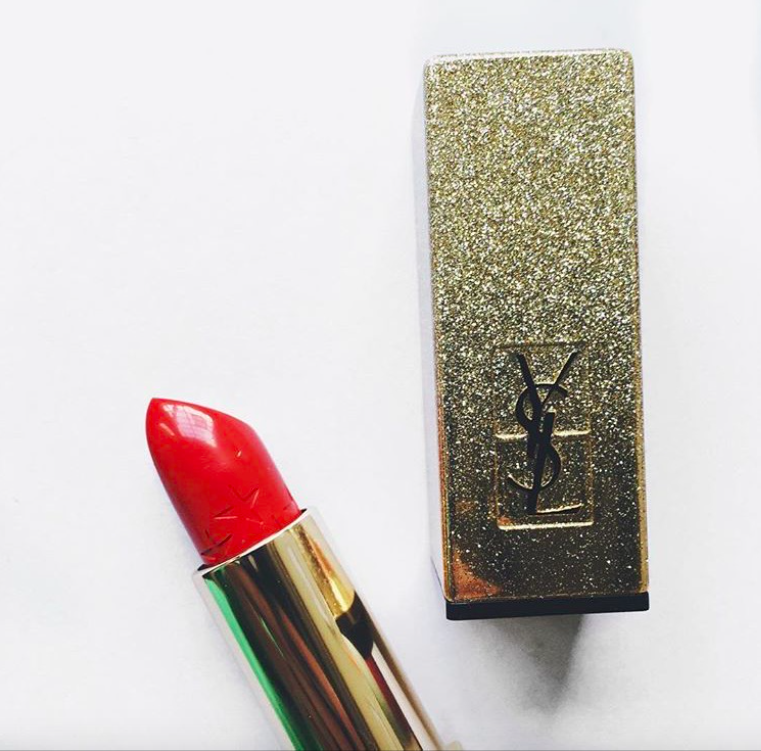 I've had YSL lipsticks before and I adore them. They're creamy, they last longer than you would think, and the tubes are undeniably gorgeous. When I saw that they were releasing a few shades in this packaging, my glitter radar went off and I made the splurge because it was Treat Yourself Day. No seriously, it was. Thanks Parks and Recreation. The shade 01 is a pretty standard bright blue toned red in a satin finish. I know I have too many red lipsticks, but they're all matte and I think that a bright poppy red in a satin finish is just too perfect for the holidays. The details on this lipstick are wonderful, too. From the glittery tube to the stars embossed into the side of the actual lipstick, it surely isn't lacking any detail nor elegance. And for the actual formula, it's wonderful! It's creamy, comfortable and long-lasting. What more could you ask for? Since it is a satin finish, it feathers ever so slightly on me (could feather less or more depending on the person). That could easily be combated with some lip liner or concealer on the perimeter of your lips, if it's something that would really bother you. I really love it though! Plus, it's so fun to pull the tube out! Yes, last week brought about a new tune from Little Mix, my favorite #GirlPower divas in the game. We're only a week away from their fourth album debuting and I for one could not be more excited (DNCE's comes out the same day too). We deserve something good in our lives. This song is a bit slower than the first two singles they've released from Glory Days, but it still packs in the same amount of sass, lacing it with hip swaying melodies. It has the same 60s girl group vibes that I got from "Love Me Like You" from last album, just a bit toned down. I will sing this song with all of my heart and soul in the car, in the shower, around Target. You go, girls! Okay, so sponge candy may or may not be a foreign concept to some. I think there might be some places that call is sponge toffee? I'm not sure if it's a Buffalo candy solely, if it started in Buffalo and spread, or if it just became insanely popular back at home. Whichever the case, it's amazing. It's basically just sugary toffee that looks like a sponge. It's light and airy and then it's just covered in chocolate, whether it's milk, dark, or even orange. I personally think the best flavor of it is orange chocolate, but that's just my personal preference. I digress, it's probably my favorite candy and my Fairy Godmother sent me some with my dad when he visited on Tuesday and I've been in heaven ever since. If you ever come across sponge candy in your travels, try it. It's a bit weird at first, but then it will grow on you and you'll fall in love and will want to marry it. Or at least eat a second piece. I'm in love with Sally Hansen polishes. They're so underrated, I swear. I got this shade a few years ago and I always forget about it without a fail every season. Then, I rediscover it in my collection, wear it, then fall in love all over again. It just doesn't budge. It takes effort for me to try to get this nail polish to chip. I distinctly remember wearing it for two weeks straight without needing to touch it up. It was insane. And the color is just perfect for this time of year! It's a dark purple with a tinge of grey that makes it a little murky. I think the color is just so cool and edgy without being a straight up black nail polish shade (which I will sport inevitably at some point this season). It's a one to two coat formula, it dries in a decent amount of time (I use their Insta-Dry top coat as well) and just wears like a dream.